Tours depart at 8.30 and 12.30. We are comparing Skip the Line Vatican Museums, St. Peter's Basilica and Sistine Chapel Small-Group Tour Prices from leading ticket suppliers and Try to find you Cheap tickets prices on the market. A visit to Rome wouldn't be complete without a visit to the home Pope Frances, the centre of the Catholic Church and the world's smallest independent country, the legendary Vatican City. During this 3-hour tour you'll enjoy the benefits of priority entrance tickets, so you can forget about waiting in long entrance queue and skip to the front of the line. Once inside, your certified art historian guide will lead you through the monuments, courtyards and galleries, pausing to marvel at collections of work world-renowned artists such as Michelangelo, Botticelli, Rosselli and more. Understand the history and significance of the Vatican City, not just to Italians, but throughout the global Catholic population. You will visit significant locations in the ancient city, including The Raphael Rooms, The Sistine Chapel, St Peter's Basilica, The Greek Cross Room and the Round Room. You'll also explore the Galleries of Tapestries, Art, Maps and Muses. Best of all you'll enjoy the benefit of a small group tour with plenty of opportunities to interact with your guide. This tour is aimed at people who prefer a personal style tour, because of the small group's size you will have time to talk directly to your guide and ask any questions. This is also great for historians or anyone interested in learning about the Vatical City. Your Experience With Skip the Line Vatican Museums, St. Peter's Basilica and Sistine Chapel Small-Group Tour? 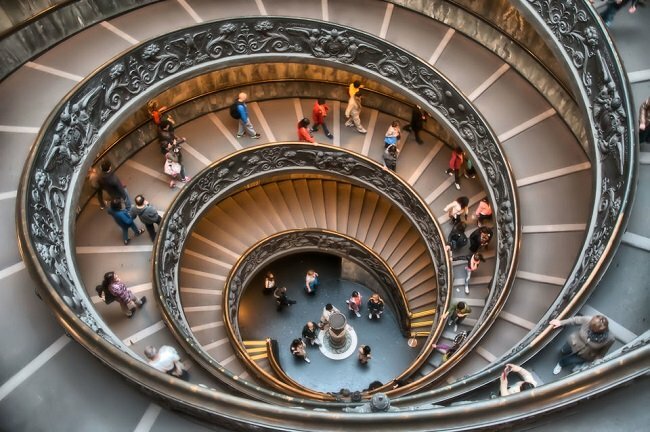 Take a guided trip through art and history on a small group tour the Vatican City, including the Vatican Museums, St. Peter's Basilica and the Sistine Chapel. Save time with skip the line entrance to this world-famous attraction. Tour the Gallery of Muses, the Red Cross Rooms, and the Octagonal Courtyard. See paintings by some of the worlds most revered artists, including Raphael, and marvel at the masterful works of Michelangelo. Enjoy the personalised experience of this small group tour and enjoy being led through a labyrinth of fine halls, corridors, and galleries. Discover the mysterious world of the Vatical city, learn how this independent state was created and its relationship to the rest of Italy. You'll also get to the secrets of the city, the myths and truths, from an expert guide and visit many magnificent works of architecture and masterpiece artworks. What Skip the Line Vatican Museums, St. Peter's Basilica and Sistine Chapel Small-Group Tour Includes? Priority Skip the Line entrance ticket. Many of the locations covered by this tour are included in the Omnia City Pass. http://www.tripindicator.com/view/discountcards/rome.html. Travelers Reviews about Skip the Line Vatican Museums, St. Peter's Basilica and Sistine Chapel Small-Group Tour? This is one of Rome's best-selling tours, travellers have described it at ‘well organised' and say that the guides are ‘excellent, knowledgeable, and enthusiastic'. The 3-hour tour has been rated as 4.7 out of 5-stars from nearly 300 Get Your Guide users who say that a guided tour is essential when visiting the large Vatican Complex. Likewise TripAdvisor and Viator users have given this tour hundreds of 5 out of 5-star reviews. Tickets are accepted in electronic or paper version. Refunds are available but cancellations should be made at least 7 days in advance to ensure a full refund. Tours are available in English, German, Spanish, Russian or French. Children must be accompanied by an adult and students should bring a valid student ID. Shoulders and knees must be covered to enter the Sistine Chapel. Despite priority tickets there may still be a short wait during high season. Meeting Point: Outside Vatican Museum Entrance.